Here’s the Good News: Jesus Christ has risen today! Alleluia! Here’s the Bad news: Hell exists. As you’ve probably heard, Pope Francis managed to create a little stir this past week in an interview where he supposedly claimed hell doesn’t exist. The source for this heretical claim comes from a 94 year old atheist, Eugenio Scalfari, who has no transcript of the interview. Rather, Mr. Scalfari jotted the Pope’s remarks down on paper to the best of his 94 year old memory. “In hell.” That suggests a place, which is the Catholic teaching on hell. 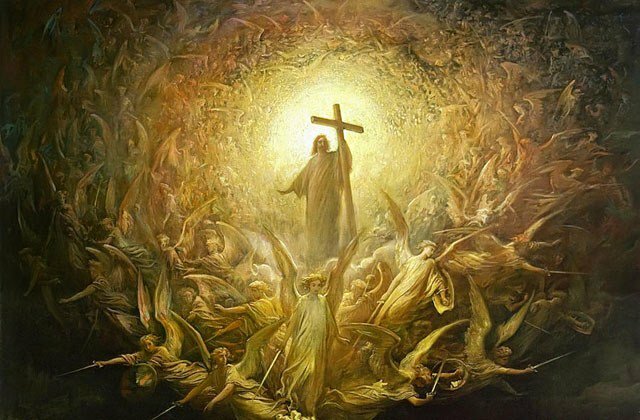 What is hell but eternal separation from God, who is love? The Pope made it clear that this ‘separation’ (a living hell, so to speak) is a terrible thing, very much in line with Church teachings. If there wasn’t a hell, why would Jesus have gone through hell to save us? He did. We’re saved. Through His sacrificial Love, an eternity in paradise awaits those who in faith believe in the resurrection.